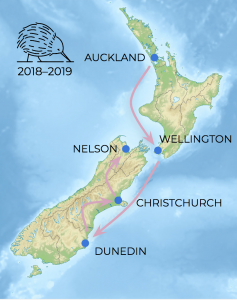 I’m excited to announce that from the end of June I’m on a one-year contract, funded by the Wikimedia Foundation in the USA, to be Aotearoa’s first ever Wikipedian-at-large. Who? What? Read on. The Wikimedia Foundation is the non-profit based in San Francisco that runs Wikipedia, as well as Wikidata, Wikimedia Commons, and a handful of other projects. They don’t write or edit Wikipedia: that’s all done by hundreds of thousands of volunteers. Their job is to run the servers, fundraise, and administer outreach programmes and community grants worldwide. This funding round they gave out US$355,473 to 11 successful grant proposals, one of which was me. It’ll cover my salary and travel and some conference fees for the year while I’m a Wikipedian-in-residence at institutions all over New Zealand. A Wikipedian-in-residence is based in an institution or organisation for a fixed term, and their job is not to just sit and edit Wikipedia. Again, that’s done by volunteers. The Wikipedian trains staff about editing, copyright, and how to make collections more freely-usable. They run public events, like Wikipedia workshops and edit-a-thons. And they help the organisation develop a Wikipedia strategy, figuring out how to engage with this amazing resource—because after all Wikipedia is the first place most people go for information, and if your institution’s mission is to communicate you can’t just pretend it doesn’t exist. New Zealand currently doesn’t have a strong community of Wikipedia volunteers, and the coverage of New Zealand topics in Wikipedia is a bit dire. We’ve fallen behind. Another part of my job description is working out how to boost the number of editors, by organising regular editor meetups, running training sessions, and encouraging institutions to support the editing groups in their community. 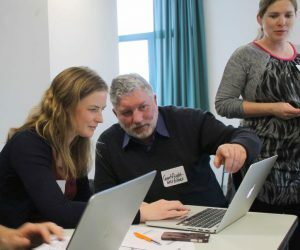 The Wikimedia Foundation is especially keen to recruit from under-represented groups, such as women and Māori, to help counter some of Wikipedia’s biases. I’ll also be working with the Antarctic and Southern Ocean Coalition in Christchurch, the Nelson Provincial Museum, and other organisations as time and funding permits. For more information, see the news story by Farah Hancock back when I first applied for the grant, and the detailed Project Page, which has timelines, reports, details on upcoming activities and so on. I’ll be blogging the highlights of each month here, filed under Wikipediana. You can also join the Facebook group Wikipedia New Zealand to keep up with the news, or subscribe to the Wikipedian-at-large mailing list, so you can hear about what events I’ll be running in your area. Are you part of an institution that might be interested in hosting me as a Wikipedian-in-residence? Would you like me to come and give a talk on Wikipedia to your colleagues or run a workshop? Get in touch and we can find a space in the calendar. I’ll be putting my possessions in a storage locker and being a digital hobo for a year all over New Zealand. Do you know of any house-sits, writer’s residencies, spare rooms, sublets, visiting-scholar accommodation, or DOC huts in need of a warden in your area? All suggestions and offers gratefully received, as long as they have wifi. Are you just interested in Wikipedia and want to volunteer to help? We have a good team of volunteers and can always use more. This entry was posted in Wikipediana on 21 May 2018 by Mike. The Whip Scorpions of Bali Why engage with Wikipedia?